Dean Perkins was born in the small hamlet of Montpelier, Idaho, but has spent most of his life in Ogden, Utah and Sun Valley, Idaho. 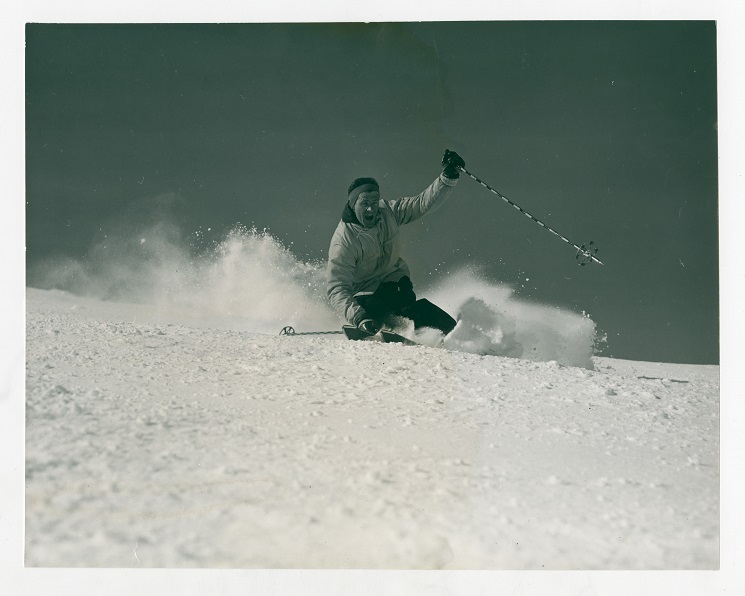 Dean Perkins started his ski racing career riding the rope tow and slashing through the willow branches that made up the first race courses at Snowbasin, Utah. Those early training runs led him to the Weber State and University of Utah ski teams (and tennis teams), and more than a few podiums. Among his early successes were placing 1st at the US National Championships Downhill at Aspen, 1st in the Giant Slalom at the Disney Cup in Mineral King, California, 1st in the US National Championships Giant Slalom in Reno, Nevada, 1st in the Downhill at the Pacific Northwest Ski Association, 3rd in the US National Championships Downhill at Sun Valley, 3rd in the Harriman Cup Downhill at Sun Valley, and 3rd in the International Ski Association Downhill in Utah. 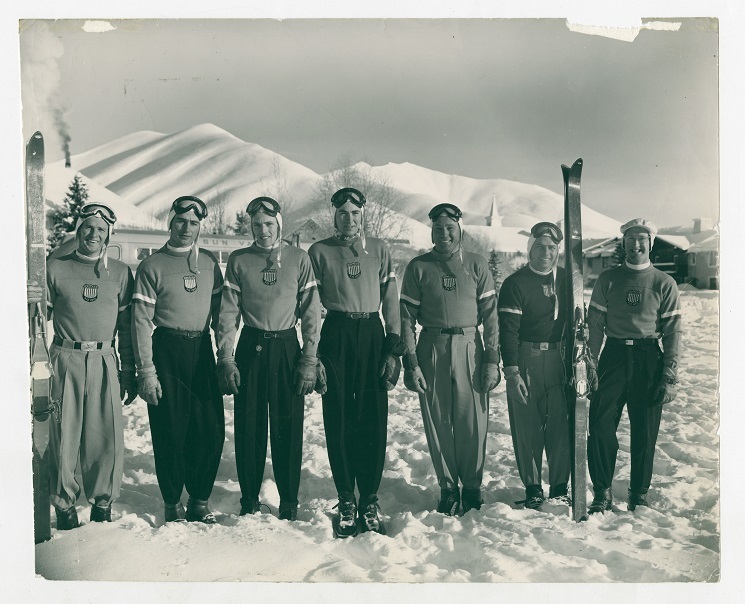 Photo: Standing with FIS ski team in 1950. 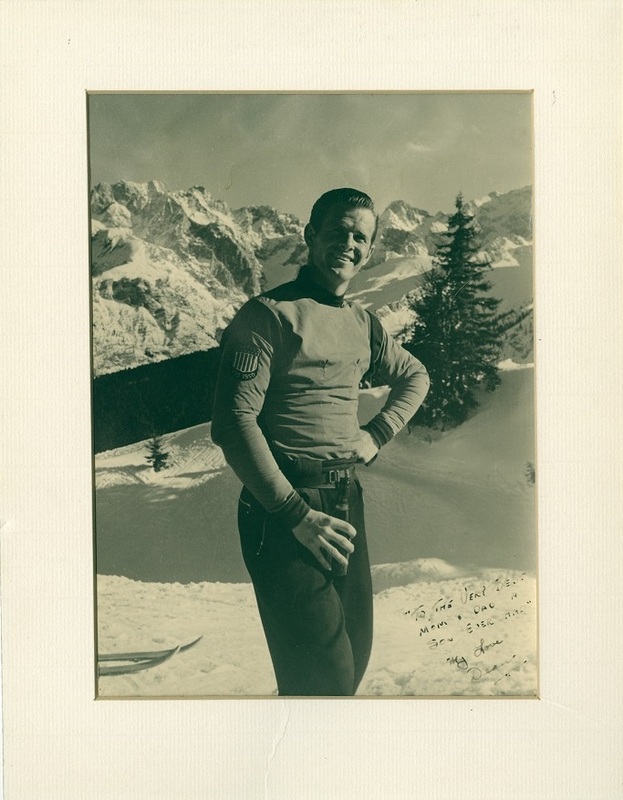 Dean was a member of the US FIS World Cup Team in 1950 and 1951. After being drafted into the US Army during the Korean Conflict, he was selected for the US Army Ski Team. He raced for a season on the International Circuit, including several races for the US Olympic Team after the Olympics, and events in St. Moritz, Davos, Klosters and Zermatt in Switzerland, Garmisch and Berschesgarten in Germany, and Innsbruck and Seefeld in Austria. During his career in Europe, he took a 1st in Downhill, 3rd in Slalom, and 1st in the Alpine Combined in the All European Command Ski Championships. 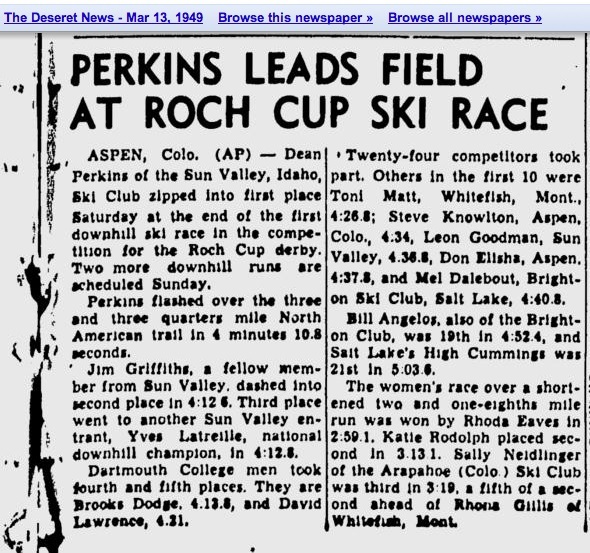 Dean won the inaugural Roche Cup held on Aspen Mountain when the downhill had no gates and was just a mad dash to the finish, and later displayed his elegant, fluid style off the race course while appearing in some of the early Warren Miller ski movies. 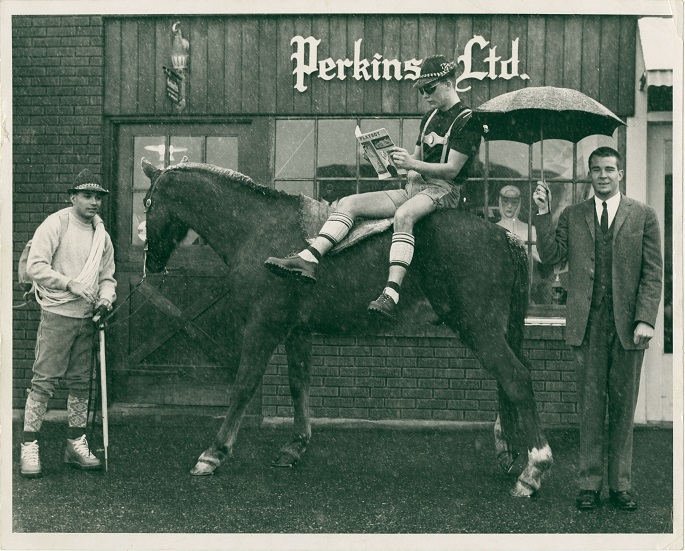 Photo: Advertisement for Perkins Ltd.1967. He opened Perkins Ltd. Specialty Shop in Ogden in 1955, and for twenty years successfully sold ski and sportswear, mountain climbing gear, and a complete line of tennis equipment and apparel. 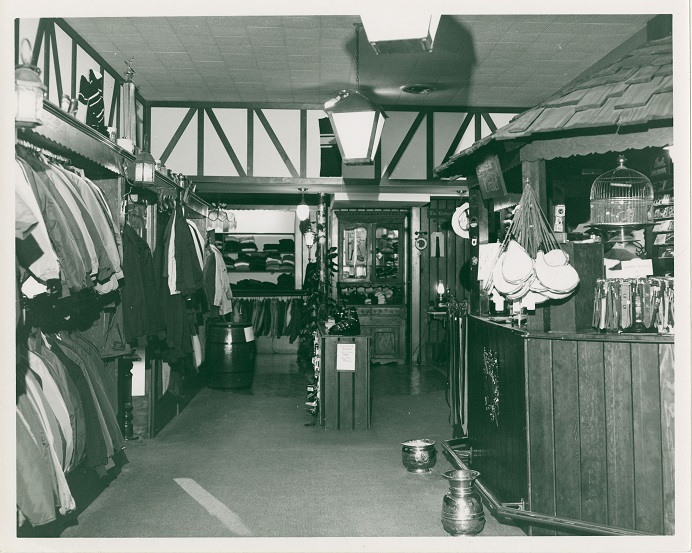 He was also a manufacturer’s rep for Roffe and Demetre Ski Wear, covered nine states in the mountain west and Midwest, and played a key role in helping the brands become two of the top ski clothing lines in the U.S.
Photo: Inside Perkins Ltd. Store, 1965. Dean also started the Perkins, Ltd. Ski School, which evolved into the Ogden Examiner Ski School and taught thousands of people to ski and love the sport. He was on the board of directors of the W.W.S.R.A. 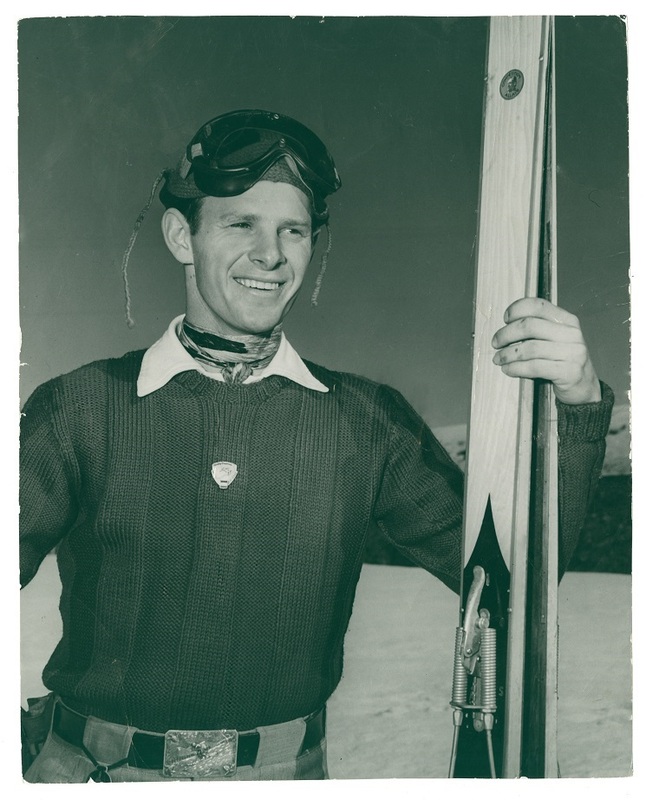 His numerous regional, national and international titles and podiums, his significant commercial contributions to the Utah and intermountain ski industry, and his impact on ski instruction in Utah make him one of Utah’s true ski legends and a deserving inductee into the Intermountain Ski Hall of Fame. 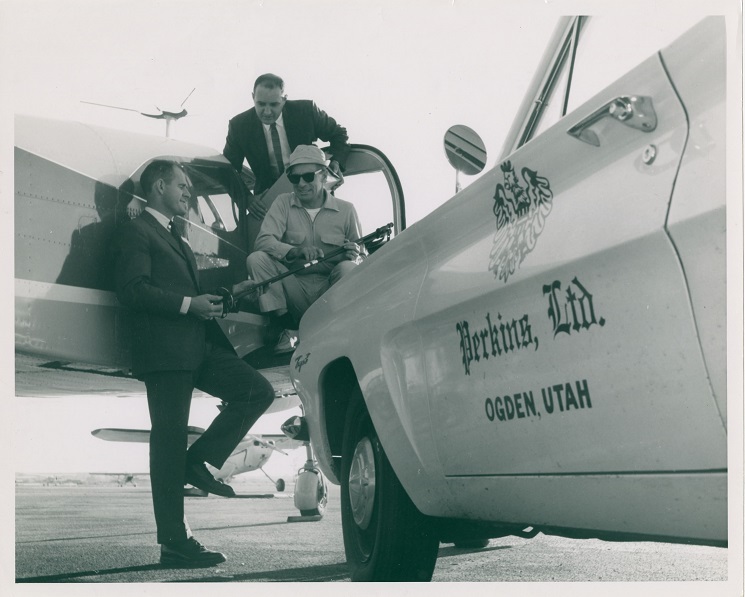 Photo: Dean Perkins at Ogden Airport receiving a new ski pole. 1964. Among Dean’s other accomplishments – he has climbed the three highest peaks in the Tetons, played tournament tennis in Europe, raced motorcycles, a Porsche Speedster on the SCCA circuit, and catamarans, and is a licensed pilot. Photo: Dean Perkins in Garmich, Germany. 1952. Dean continues to ski at Snowbasin Resort and makes his home in Eden, Utah.